Sometime ago, I was challenged by a comment in Sunday school. It led me to conclude that even though we spend a lot of time pointing out problems we generally spend very little time actually doing something about them. 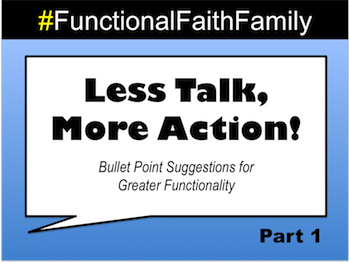 As a result, I have begun running a slideshow of simple suggestions to help our church family grow in functionality. I call the slideshow "Functional Faith Family." I pray that these simple suggestions will be a blessing to you and your church family. Do you know everyone’s name? If you are like me, faces are easy, but names come hard. Familiarization is the key. Open it to a family that is unfamiliar. Lay the directory in an obvious place that will force you to see it several times each day. Drill yourself on their names every time you see the directory. Bible class teachers devote a great deal of time to preparation. Encourage them by being present. Ask questions and make comments. Study the topic ahead of time. Give greater priority to the study of God’s Word than you do to school, work, or recreation. Think of the auditorium and where people sit on a typical Sunday morning. What person(s) needs a friend? Make it your goal to engage them in conversation at every service. Invite them out to eat after service. Galatians 6:10 (NIV) "Therefore, as we have opportunity, let us do good to all people, especially to those who belong to the family of believers." Few things are more urgent or important than preparing ourselves to be functional, and therefore, a benefit to the family of believers.